We all love Starbucks, right? But let’s be honest, those $5 price tags can sure add up quickly. 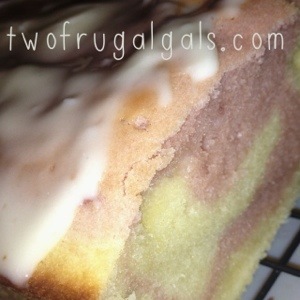 I recently posted a wonderful recipe for Copycat Starbucks Iced Lemon Pound Cake and after trying their fabulous Raspberry Swirl Bread the other day, of course I wanted to try my hand at making my own. I’ll will say, it took more time to prepare this delicious bread than I thought but it was totally worth it. When I thought about all that money I saved (I even had enough to freeze for later) It made for a sweet and frugalistic deal. Preheat oven to 350 F. Lightly grease a 9×5 loaf pan with non-stick spray. 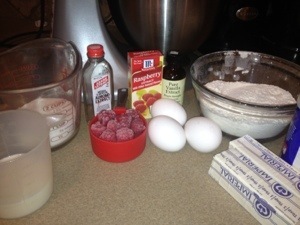 In a medium sized bowl, whisk together milk, eggs, and raspberry, vanilla and almond extracts. (Raspberry extract is optional but is a great addition if raspberries are not available or are very ripe—it just adds touch of flavor). Set aside. Set a mesh strainer over a small bowl. 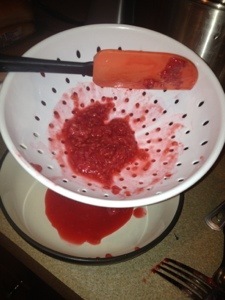 Use a spatula to push and mash the raspberries through the strainer. The seeds and pith will be left behind and the raspberry juice will be in the bowl. Set aside the raspberry juice and discard the seeds and pith. 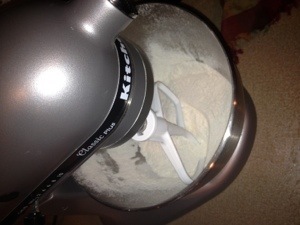 Sift flour, sugar and baking soda into the bowl of a stand mixer.Fit mixer with paddle attachment, and turn on low. Add in softened butter and mix on low until the flour/butter mixture has combined. It doesn’t have to be completely smooth, but just make sure majority of flour and butter has been mixed together. 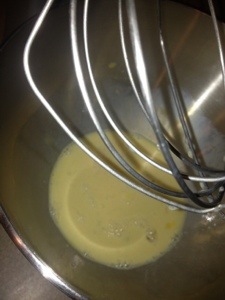 Slowly pour the eggs/milk mixture into the stand mixer in a steady stream. Continue to beat on low or medium-low until thoroughly mixed. 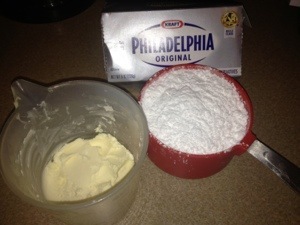 Remove stand mixer bowl from mixer and pour about 1/3 to 1/2 of the batter into a separate bowl. 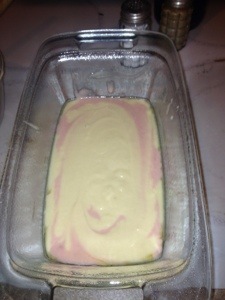 Into the smaller bowl of batter, stir in the raspberry juice. Alternate pouring the two batters into the prepared loaf pan, smoothing out the batters with a spoon between each addition. Bake for 45-50 minutes or until a toothpick inserted into the middle comes out clean. Remove pan from oven and set it on a wire rack. Let bread rest in the loaf pan for 10-15 minutes, then turn it out of the pan and allow bread to complete cooling. In a bowl using a stand or hand mixer, beat together softened butter and cream cheese until smooth. Slowly add in powdered sugar and combine until smooth. Spread frosting over the top of the cooled pound cake. Let it rest, then slice and serve. Enjoy!